On Thursday 22nd December 2012 at lunch time, I wandered down to the Bank of China near Wynyard station (Sydney) and filled in my application form. The form was to apply for the bank account. The bank also took a copy of my passport and my HKID as well as a letter in the same name which had my home address. The bank branch was very quiet even at lunch time. There was one lady who was at the enquiry desk who helped me out. I took a seat and explained what I wanted to do and she just asked me if I had all my ID and documents with me. I had to write my Chinese name a couple of times which was a bit embarrassing as my handwriting looks like a 5 year old's! You know how some kids may write S or L or some other letter "backwards"... that's the type of handwriting I have! I had to silently giggle when the lady asked if I could "read Mandarin"! (Not Chinese but "Mandarin"). In any case I wouldn't be able to handle a fully Chinese written form especially if it was in simplified Chinese so I just said no. After I filled in the form/s, the lady checked it for me and I paid my A$100 cash (remember to take cash!) and got a receipt. Apparently now all I have to do is carry my HKID everywhere in case someone calls to verify who I am. I’ve recently learnt about Tabata and how this can help me optimise the time I spend on exercising. Reducing it down to less than 5 minutes a day! So of course I had to give it a go. I started this on 19th December 2011 so it’s still early days. Let’s see if this can replace the longer runs I would normally do with Sprocket. I decided to do this with my trusty exercise bike (seriously this has been probably the item which has been the best value in terms of exercise equipment – I bought it around 1995 for over $200 from Rebel Sport and I’m still using it regularly!). So I exercise in quick intervals of 20 seconds going as fast as I can and then 10 seconds of slower cycling. To make it easier I downloaded an Android App (Interval Timer AD) to help me identify the end of the 20 or 10-second ‘stints’. I wonder why the 20 seconds seems so long and the 10 seconds so short . I do this for 8 cycles and after I can feel it. I can feel the ‘Afterburn’ and my heart rate is accelerated. Actually I should grab my heart rate monitor and see how my heart is going (although I never really understand where I need to be etc and have to look it up every time). After the 3 mins 50 seconds I am a total sweat ball! And have been sitting on the couch doing some eye exercises for 5 or so minutes. I use the interval timer for that that too but any timer will do. Another benefit of the Interval Timer AD app is that it logs the exercises for me and I can save the timer ‘settings’ and load them up. If you are thinking of doing Tabata or interval training I would definitely recommend using an app as you really don’t want to try and think or count whilst going all out. On the bike I’ve found that I reduced from “level 4” intensity to “level 3” and now have set the bike to “level 2”. It’s hard! But the good thing is that it only goes for less than 4 minutes! I’ve yet to do it more than once a day and this morning I skipped it as my calf muscles were feeling tight. The HK government is doing HKD6000 handouts to all Permanent Hong Kong ID holders. After hearing about this for months now my mother tells me to hurry up and sort it out. Unfortunately I need to get a LOCAL (as in Hong Kong) bank account open in my name (ie not a joint account). Anyway I wandered down to the HSBC branch and they can’t help me unless I want to wait 6-8 weeks for an account to open. 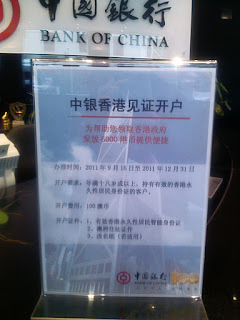 I then went to Citibank and they can open a foreign currency account but not a ‘local’ account… so I tried Bank of China. I just called them as I didn’t want to walk down there (after having just come back from that way). And they can do it all for me! I just need to bring my HK ID, Passport and evidence of current address. All of this needs to be done by 30th December 2011! So get your skates on down to your local Bank of China branch (there aren’t too many of them) and pay your AUD100 to get your HKD6000!